With the price of petrol rising due to volatile oil prices here are some tips to help you keep a reign on your monthly fuel budget. However, remember it's not just about finding cheaper petrol, it's about using less, making it go further or not using the car at all. Cheap Petrol - The first thing is to find the cheapest petrol station in your area as this can save you up to 5p a litre sometimes on your regular petrol filling station. I usually look at petrol prices when passing stations but the site PetrolPrices.com tells you the prices for most petrol stations in the UK and is regularly updated. One other thing I tend to do is when I visit my sister I always make sure I've got enough petrol to get me there (she's only 35 miles away from me). On my way home I stop off at the local petrol station and fill up because it's always cheaper. Watch out for supermarket promotions. Tesco and Sainsburys often have a deal on where you spend £50 or more in store and you get a voucher which entitles you to 5p off every litre of petrol. This can save you at least £2.50 a tank, if not more. Every little helps! If, like me, you very rarely spend £50 or more on visits to your local supermarket and you happen to have an Asda that is quite near, you can get their new credit card which gives you 2p off every litre when filling up at their stations. That way you don't even have to spend a penny in their store, although personally I prefer Asda! Most companies have electronic notice boards or notice boards of some sort. Put up an advert to try and arrange car sharing or offer people who don't drive and rely on public transport regular lifts in to work. This will halve the cost of petrol on commuting to and from work. There are also a couple of sites that you can register on if you are happy to make an arrangement with someone outside your place of work. One of them is Liftshare where you enter your daily journey and it will match you up to people who do the same journey as you and might be a suitable person to share lifts with. The other site is freewheelers which is also an online database for people offering and requiring lifts to and from work. On top of that is can put you in contact with people traveling to festivals, gigs and sporting events. Stick to the speed limit or even better if you do a lot of motorway driving find out the most economical speed for your car and do that. Don’t be lazy, if you need to go somewhere that you can very easily walk to or cycle to (e.g. The corner shop or takeaway), leave the car at home and get some exercise and fresh air. In other words, think before you leave the house and only use your car if you can justify it. A lot of cars these days have air conditioning, whilst it is a very nice luxury to have; it can increase your fuel consumption by up to 20%. So think twice next time you automatically put the air con on. Will putting the fan on or opening a window suffice? Is the temperature really that uncomfortable? Extra and unnecessary drag equals an increase in fuel consumption. So if you have a roof rack or bicycle rack that you are not using, remove it. Similarly extra weight can increase fuel consumption, so if you've got a boot full of things, empty it! 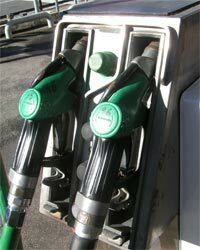 A well maintained car will be more economical on fuel. So make sure your car is regularly serviced, the air in your tyres are pumped up sufficiently (check you car manual for the correct tyre pressure) and don’t wait until your petrol tank is nearly empty before filling it up again as this can clock up the fuel filter and reduce your cars performance.